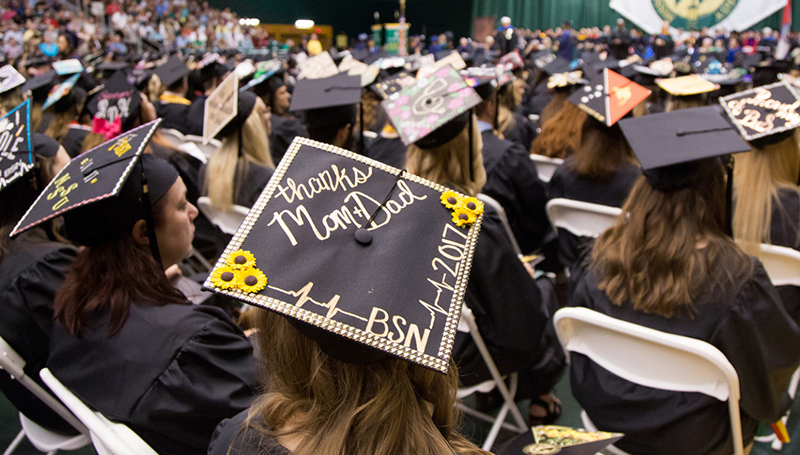 Winter commencement ceremonies will be held at 10 a.m. Saturday, Dec. 16, in the Leggett & Platt Athletic Center at Missouri Southern State University. The 69th graduating class includes 421 students receiving 487 undergraduate degrees, and 23 students receiving graduate degrees. Bryan Vowels, a 1992 graduate of Missouri Southern, will be the keynote speaker. At MSSU, Vowels was involved with campus life including serving as president of Student Senate and Phi Beta Lambda. He received the Outstanding Graduate and Spencer Bartlett Respect awards. He went on to get his MBA from the University of Arkansas where he received the Sam Walton Achievement in Excellence in Leadership and Academics Award. He also holds his Certified Financial Planner and Chartered Financial Analyst certifications. He was named Outstanding Alumni from MSSU in 2012. Vowels now serves as a Managing Director – Investments with the Vowels & Stovern Wealth Management Group of Wells Fargo Advisors. He also serves as branch manager for the Joplin Wells Fargo Advisors Office. In 2011 and 2014, he was named one of the top 100 branch managers in the country by On Wall Street. Prior to joining Wells Fargo Advisors, he served as a national bank examiner with the U.S. Treasury Department and as a senior vice president for a local bank in Fayetteville, Ark. He and his wife, Leticia, have been active in the Joplin community since returning to the area in 2001. They both helped start the Aspire Scholarship Program that provides scholarships for single parents seeking a career-oriented degree. He has coached soccer in the area the past 15 years and also helped start Rebuild Joplin after the tornado devastated the community in 2011. Vowels is past president of the United Way of SW Missouri and the Bright Futures USA Board. He currently serves on the MSSU Foundation, Bright Futures Joplin, and Community Foundation of the Ozarks Joplin Board of Directors. KGCS-TV will provide live coverage of the ceremony, which will also be rebroadcast at 7 p.m. Sunday, Dec. 17. The station is available on local cable systems, including Cable One, Mediacom and Suddenlink. DVD copies will be available for purchase. For more information, contact Judy Stiles at 417-625-9777.